Bow wow, woof woof. Or words to that effect. After more than a week on the streets, Pluto was glad to be sleeping in his own bed last night. And so, for that matter, was his owner, Demetre Papadopoulos . Papadopoulos and his trusty 13-year-old Dalmatian were back in their apartment this weekend for the first time since fleeing a six-alarm fire Sept. 24 that displaced some 1,200 residents from the highrise apartment building at 200 Wellesley St. E. The duo were among the first 200 residents allowed back Saturday. Another 140 were allowed back in Sunday, leaving more than 800 people still living in shelters, hotels and other accommodation. For Papadopoulos and Pluto, the all clear to return to the building could not have come at a better time. Since the fire, Papadopoulos said he and his dog have been sleeping outdoors in alcoves and doorways and the weather was turning a bit cold for their liking. The pair spent most of the day Sunday sleeping in their own beds. 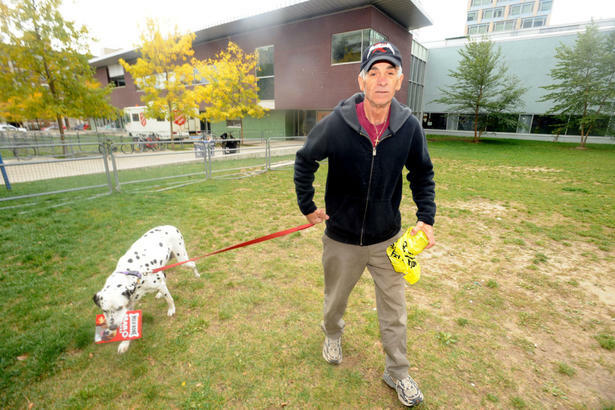 “Its great to be back home,” said Papadopoulos as he took Pluto for a bathroom break outside the Toronto Community Housing building he’s lived in for the past 20 years. “This was very hard on both of us. Pluto is still little nervous, with the smell of smoke and all these people coming and going.” It is not the first time the two have shared a traumatic experience. Five years ago Papadopoulos made headlines when he left Pluto with a friend while he went to Greece to settle his mother’s estate. He returned to learn the friend had turned Pluto over to the Toronto Humane Society which in turn adopted the dog out. Papadopoulos had to go to court to get him back. The two have been inseparable since. A virtual army of police officers, health officials, social workers and housing officials were on the scene Sunday to supervise the orderly return. Many of the residents were reunited with their pets for the first time since the fire forced them out. “They took my Teddy up to a shelter on Sheppard Ave., and I hope he’s okay,” said a worried Dorothy Butler, 76, as she sat in her motorized wheelchair. Minutes later a huge smile wiped away those worries, as her Shih Tzu found a place on her lap. The scene outside 200 Wellesley took on the look of a march to the Ark, with most residents, it seemed, returning home carrying at least one pet. Anne Martel had her dog Charlie on a leash, and her rabbit Thumper in a cage. “This has been incredibly traumatic for me,” Martel said, adding she found shelter with her family during the forced evacuation. “I’ve been going through some personal problems and now having to deal with this fire and evacuation has been really hard.” Firefighters described the blaze as one of the worst apartment fires they have ever seen. Fourteen people were hospitalized, including three children. Abdul Omar, 7, was doing his best to help his mom Zeineba move back into their 17th-floor apartment. “This sure is heavy,” he said as he dragged a large garbage bag of clothing along the sidewalk. Fire officials said the intensity of the fire, which started on the 24th floor, caused severe structural damage to certain parts of the 30-storey building. Health officials are monitoring air quality and tenants are not allowed to return until those tests show it is safe to do so. Toronto Community Housing is Canada’s largest housing provider and home to more than 164,000 tenants, about 6 per cent of the city’s population.